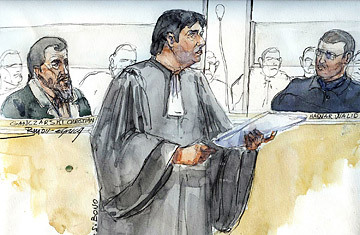 French Terror Conviction: Lesson for U.S.? A court in France has convicted a German convert to radical Islam for his involvement in a 2002 suicide attack on a synagogue in Tunisia that killed 21 people. Christian Ganczarski was found guilty of complicity in the plot and sentenced to 18 years in prison. That was a shorter sentence than prosecutors had hoped for, but French justice officials say the case and its outcome is, nevertheless, a timely reminder to Washington that international cooperation to combat terrorism can succeed without recourse to phantom prisons, extra-legal trials, or morally questionable extraordinary renditions. President Barack Obama has said that he will seek to shut Guantanamo, address detainee charges of kidnapping and torture, and return terror suspects to federal court systems, where convictions and stiff sentences may be difficult to obtain. French officials, who had asked for a 30-year sentence for Ganczarski, were still pleased with the outcome. The guilty verdict in a such a difficult case, they note, is a sign that France's counter-terrorism and civil justice system works. "It's gratifying to see the French legal system can both enhance security and render justice to victims by prosecuting terror cases above the board, and by the book," says Marc Trévidic, a senior investigating magistrate in France's specialized anti-terrorism division. "It's especially true in a complicated case like this one." The case was certainly complex. Ganczarski was initially investigated by German authorities, who knew him as a radical with ties to al-Qaeda. But despite uncovering significant evidence of Ganczarski's jihadist activities  including links to the Tunisian plot  German officials eventually freed him, citing legal technicalities that prevented them from filing charges. When Ganczarski traveled to Saudi Arabia, German authorities alerted Saudi counterparts he was suspected of extremist activity. After Saudi police observed Ganczarski meeting with local radicals, American and French intelligence services where brought in on the case  and soon devised a way of taking Ganczarski out of action without resorting to kidnapping or extraordinary rendition. There, they knew, French justice officials had an official opened an official investigation open on two French tourists who'd been killed in the Tunisian bombing. When Ganczarski touched down in Paris on June 2, 2003, he was taken into custody. "Whenever a French citizen is in anyway responsible for or a victim of terrorist activity anywhere in the world, French law allows us to open an investigation with the intent of taking it to trial," Trévidic explains. But given the over-lapping legal structures and security forces that had become involved, building a convictable case with far-ranging evidence required both a lot of work, and faith in the system, Trévidic says. "Eighteen years wasn't the 30 we sought, but it's still a reflection of how serious the court took the claims of complicity established in the case," Trévidic notes. "And who knows  he could get the full 30 in the appeal." The outcome of the French trial comes at a significant moment. On Monday, a U.S. Court of Appeals in San Francisco will hear a case brought by three plaintiffs charging they were tortured during extraordinary renditions the Bush administration approved as part of the war on terror. Previous legal challenges to such measures were thwarted by government refusal to provide courts with evidence or testimony requested, citing state secrecy. Many observers now hope the Obama administration will release previously withheld information as it deconstructs the extra-legal system for dealing with terror suspects and return them to courts that handled them before 9/11. "That's an important move, because trials and convictions are supposed to render justice to victims, their families, and society  and revenge-seeking kangaroo courts don't do that," a French counter-terrorism official notes. "Does that risk [the possibility of an] innocent verdict or lighter sentences? Yes. But that's how the system works. Fix or improve it if you don't like it, but don't stick another rigged system on top of it." Read a TIME cover story on al-Qaeda.